New Delhi : India on Sunday celebrated 147th birth anniversary of Mahatma Gandhi. Prime Minister Narendra Modi and President Pranab Mukherjee paid their tribute to 'Father of the nation' at his memorial at Rajghat in New Delhi. 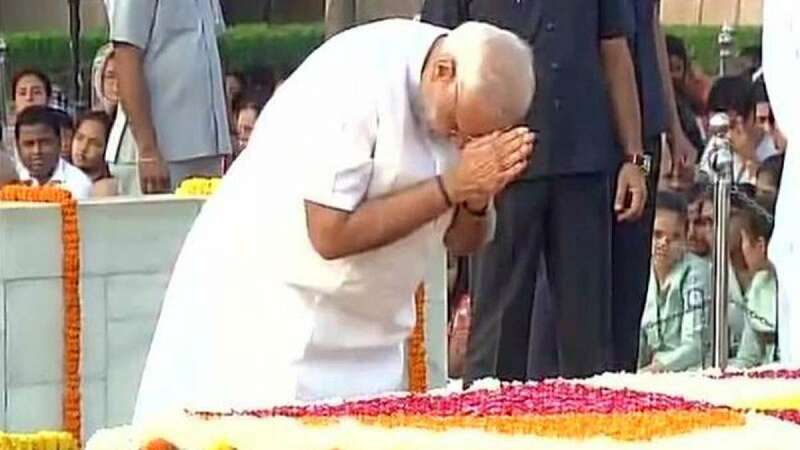 Other prominent leaders like Union Minister Venkaiah Naidu, former Prime Minister Manmohan Singh and Delhi Chief Minister Arvind Kejriwal also paid their homage at Rajghat. PM Narendra Modi also paid a visit to the memorial of India's second Prime Minister Lal Bahadur Shashtri, who shares his birthday with Mahatma Gandhi. # India on Sunday marked 147th birth anniversary of 'Father of the nation' Mahatma Gandhi. # Prime Minister Narendra Modi paid his tribute to Mahatma Gandhi at his memorial in New Delhi. He also visited memorial of 2nd Prime Minister of India - Lal Bahadur Shastri. # Delhi Chief Minister Arvind Kejriwal also paid his tribute at Rajghat. # Several other prominent leaders like Lal Krishna Advani, Hamid Ansari, Venkaiah Naidu and other also visited his memorial at Rajghat. # Ex-Prime Minister Manmohan Singh also came at Rajghat to pay homage.